Property TV - does anyone actually watch it? I seen Property TV filming at property shows and events but no one here ever talks about it or mentions it and I am a member of a number of facebook property groups, and never seen it referred to on fb either. Just curious really .... do you watch it? An organisation run by the Hammonds, a father and son team with a trail of failed businesses behind them. Also on the list of former directors you will find a Benjamin Rogers of Lease Options fame, currently bankrupt and currently facing fraud charges and I think still on police bail - but I may be wrong on that. I believe that much of the £1.9 million that Ben owed when he was bankrupted, was pumped into PTV. When the IP went after the assets of PTV to repay Ben's creditors, the cupboard was bare. Another successful foray by the Hammonds to profit from other peoples' gullibility. Their accounts are overdue at Companies House, which means that the company is administratively delinquent. I think you may be referencing "Homes Under the Hammer? This thread is about Property TV - a dedicated channel on Sky. 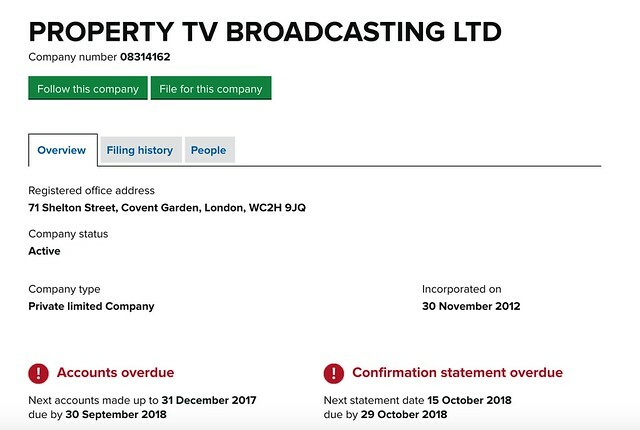 Companies House is now showing Property TV has an "active proposal to strike off". Of the four active companies - all TV production related - that Michael Hammond is Director of, three are administratively delinquent and showing "accounts overdue". It looks like that cow has now been sufficiently milked to death. The creditors will not see a penny of the money owed. Another successful and very profitable exercise by father and son. Look out for the Hammonds' next foray into the property market under another guise or with another "too good to be true" offer.